Yahoo! took the world by storm in the 1990s as a one-of-a-kind, searchable list of interesting web sites. But ten years later, it has expanded into a department store overflowing with useful and innovative tools and services-from email, blogging, social networking, and instant messaging, to news, financial markets, shopping, movie and TV listings, and much more. Today's Yahoo! keeps you connected with every aspect of your life and every corner of the Web. Whether you want to become a power searcher, news monger, super shopper, or innovative web developer, Yahoo! 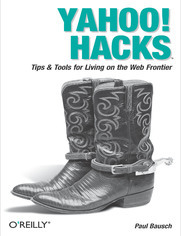 Hacks provides the tools to take you further than you ever thought possible. Hack #6. Translate Any Page with Yahoo! 1.13.2.1. Get notification of new email. 1.13.2.3. Add content to My Yahoo!. Hack #18. Track News About Yahoo! Hack #21. Track Additions to Yahoo! Hack #34. Personalize My Yahoo! 2.14.1.1. Go to the source. 2.14.2. Adding to My Yahoo! Hack #38. Replace Your Phone Book with Yahoo! 2.17.1.2. Sending to cell phone. 3.2.3.1. Anatomy of a keyboard shortcut. 3.3.2.2. Block specific addresses or domains. 3.7.1.3. Quick Add Event form. Hack #66. Send Instant Messages Beyond Yahoo! 3.18.1.3. From an email address. 3.18.3.1. Free to the public. 4.2.1. What Are Web Services? Hack #92. Get Your Site Listed at Yahoo! 6.2.2.1. Adding a noncommercial site. 6.2.2.2. Adding a commercial site. Hack #93. Hide Part of Your Web Site from Yahoo! Hack #94. Search Your Web Site with Yahoo! 6.6.5. Submitting Video to Yahoo! 6.8.1.2. Posting to your weblog.